Today’s idea is something that catechists of every grade level can take advantage of – I call it the Declaration of DEpendence. I originally came up with this idea when teaching about the Lord’s Prayer. It occurred to me that, with its seven petitions, the Our Father is clearly a prayer that expresses our complete dependence upon God. This is, of course, in stark contrast to the independence that we all strive for in our lives and the independence upon which our country was founded and continues to uphold. In tonight’s Confirmation intensive, one of the mini-sessions will be on the Presentation of the Candidates. 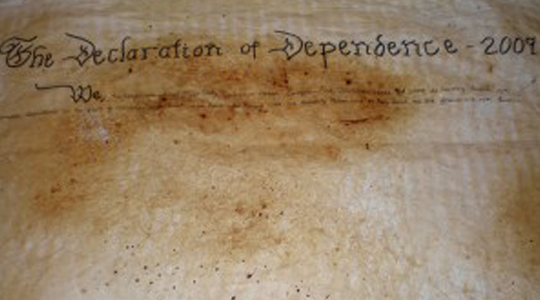 I thought this would be another opportunity to use this image of the declaration of dependence. The presentation of the candidates (and their “response” of standing up before the bishop) is a declaration on the part of the Confirmandi that they indeed wish to be confirmed and that declaration is, of course, one of embracing our baptism – the recognition of our total dependence upon God’s grace. Any sheet of white paper will do. The thinner the paper, the better. I used a sheet from an easel pad (27 x 34)…nice and thin. Roll up the paper and then slightly burn the edges (or if you don’t want to use a flame, just tear the edges). When you unroll it, you’ll have these wonderful jagged edges. Next, crumple the paper up very tightly into a ball and then flatten it out. Lots of nice wrinkles! 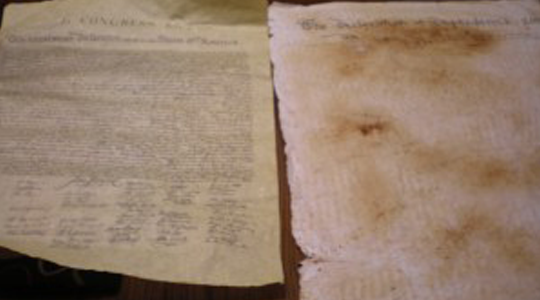 to create the “aged” look (yellowish/brownish), pour coffee or tea over it (of course, place the paper in a large pan to collect the run-off). if you’re in a hurry, you can blow-dry the document. I just hung it from a clothes line (be gentle…it can easily rip when wet) and it dried very quickly. Download the PDF version of this activity. Check out all of the activities for Lent. "What If I Don't Pass the Exam?" Joe, Thank you for all you do. We here at our parish have bought hundreds of your three books, The Toolbox, A Well Built Faith and The Bible Blueprint. We are using it for our basic formation for all catechist who enter our program. The books are wonderful and speak in a simple language that all can understand and explain to people at any age. Thank you for your Catechist Corner I have found it most helpful. Keep up the good work! Janet, thanks so much for your kind words! I’m glad that folks are finding my books to be of help in their catechist formation! You keep up the good work too! Awesome Joe! Thanks for sharing. I love how the Holy Spirit reveals such awesome truth that we can all get our hearts around…God’s blessings! Great idea Joe! We have used a Declaration of Intention (Signed by each individual Confirmandi) at the formal beginning of our Confirmation preparation process and this would be a an ideal way to bring the concept full circle. Christ’s Peace to you! Joe K., how cool! That will indeed be very fitting. Best wishes with this! love it when one idea morphs into another…that’s the work of the Spirit! I used your five Rite of Confirmation reflections in our three-hour Confirmation Preparation Classes this month. I was thrilled with the results. The activities kept these 9th graders interested and engaged. Are you considering putting your class lessons into book form? Hi Barbara and thanks for sharing your success story with us. I’m glad that you were able to adapt the Rite of Confirmation activities into your session. Collecting these lessons into a book is always a possibility…we shall see!